Evan Craft releases his DREAM Records debut Giants today! Be sure to pick up the album today on iTunes or Amazon! I had the chance to interview Evan about his fabulous debut. Below are my questions for him, followed by Evan's answers in orange. Hope you enjoy, and be sure to leave your feedback! First off, can you share how you came to be a part of the Dream Records family? How has it been to work with Dream Records on your debut project Giants? It was a wild ride being introduced to Dream Records and recording a full length album shortly thereafter. They gave me complete control over the sound of the album. It was great not having someone try to put a “sound” on my album, but wanting it to come from my heart. The album title is Giants, and both "Fight or Flee" and the title track speak of defeating the giants in our lives through the power of the Lord. Can you speak of how you learned to fight the giants in your life? I’m not exactly the biggest or strongest man in the world and, like everyone else, I have faced things that require a strength much greater than my own. "Giants" was inspired by the story of David and Goliath. My dependence on the Lord and trusting in Him has been the only way I have gotten this far in life. He’s never failed me so I will continue to trust! The album Giants is very eclectic -- whereas most of it is pop of some sort, there are a few tracks that have hip-hop twists, and others that are more soft and contemporary. Is there a certain process you follow to decide the genre of each individual track? This album was written over many years. “Broken Heart”, “Giants”, and “Reclaim” are newer to my collection, whereas “Human” was written a few years ago. I love many styles of music and the album as a whole came from working with many talented artists and trying new things. I want to talk about the amazing songwriting. Some of the tracks are very poetic, while others are very straightforward. Firstly, can you share how the typical Evan Craft songwriting process goes? And secondly, would you share the meaning behind the more poetic tracks such as "Sky is Falling" and "Human"? I’ve had a few people ask about “Sky is Falling”. I wrote the song right before I went to live in Spain for a few months. I was going through a difficult time where I did not feel supported; I felt frustrated and alone. I wrote the song in a progression of being defiant to the Lord and humbly recognizing He has always been there even when I have not recognized His presence. “Human” is about miraculous healing. The verses are from the vantage point of someone sick or depressed, and in the chorus Jesus says, “Get up and lose your cane”. We are more than conquerors in Christ and this song is meant to encourage anyone who has been defeated by circumstances or sickness and to know Jesus has made them conquerors over death. Your first single "Broken Heart" released back on February 21st and is awesome! I know that many people struggle with brokenness and depression. What would you say to someone reading this who is currently going through it? God is the only one who brings true healing. That doesn’t mean He doesn’t use doctors or other means to bring healing, but life comes through our Savior. Unfortunately, we live in a broken world. The good news is that we have been given everlasting life and can overcome any hardship this side of heaven. This song may not be the ends to someone’s problem, but it is intended to remind them of their hope. My personal favorite off Giants is "Reclaim." You did a fantastic job with the rap verses! What would be your personal favorite off your Dream Records debut and why? It is my favorite as well! A friend from Biola was telling me of the atrocity of human trafficking and it hit me like a train; the brokenness, the inescapable pain children must be feeling. God wants freedom for the oppressed. I am very uncomfortable sitting at home now while knowing about this devastation to my brothers and sisters all over the world. This song is not intended to make anyone feel guilty, but is meant to inspire. We are so privileged in the U.S.; we could stop these epidemics if we wanted to, if we trust God, and if we stand up as His people. God inspired this song and a many more in Spanish, which are far beyond my poetic capabilities in Spanish. I know God has called me to be a music missionary to Spanish speaking countries, but also here in the U.S. “No Hay Nadie” means there is no one like our God. The bridge of the song declares His holiness. It is indescribably incredible to hear hundreds of latinos singing this song in their native tongue. I am humbled and excited to see the revival that is happening through the Hispanic church. You've already played shows at churches before the release of your debut, but do you have plans for an official tour to support the project? I am actively pursuing tours right now. My not so secret goal is to open for Jimmy Needham. It would be a dream come true! Look out south west states! Here we come very soon! At the end of the day, what is it you hope listeners will take home from an honest listen to your project? That this isn’t about me. This is about God working in people’s lives. He is worthy of praise and worthy of devoting your life towards His purpose. Thanks for your time, Evan. Giants is an awesome debut! Would you like to say anything in closing to the readers of this interview? 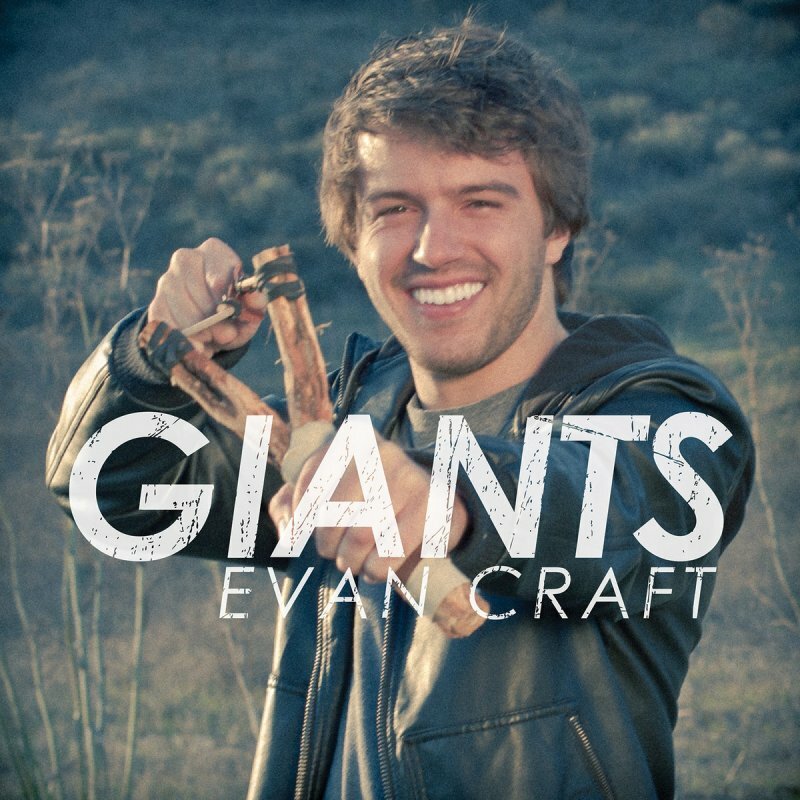 Learn more about Evan Craft at the following sites! Amazing interview! I very much enjoyed it all the way through. I will have to look up his music, he really is an amazing man of God.